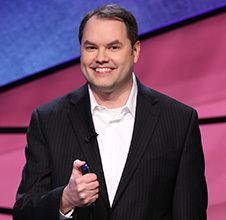 Congrats to Ben Ingram, becoming the first person to punch his ticket to the second week of the tournament. 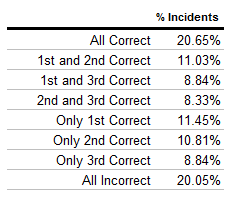 When I looked at the difference in contestant metrics between regular games and tournaments, buzzing percentage decreased by an average of 12% while precision remained relatively stable. 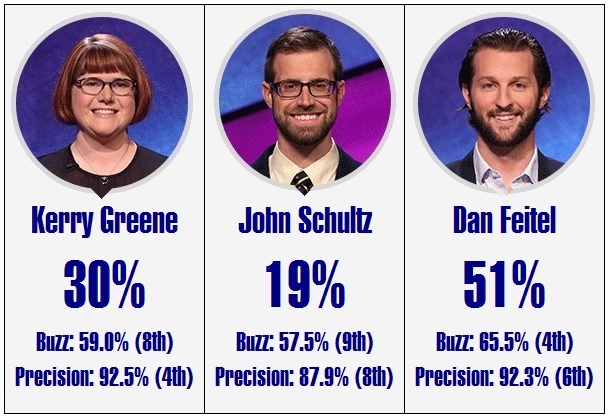 I’m happy to report that, whether by luck or design, both Ingram’s and John Pearson’s predicted metrics came darn close to matching the actual result. 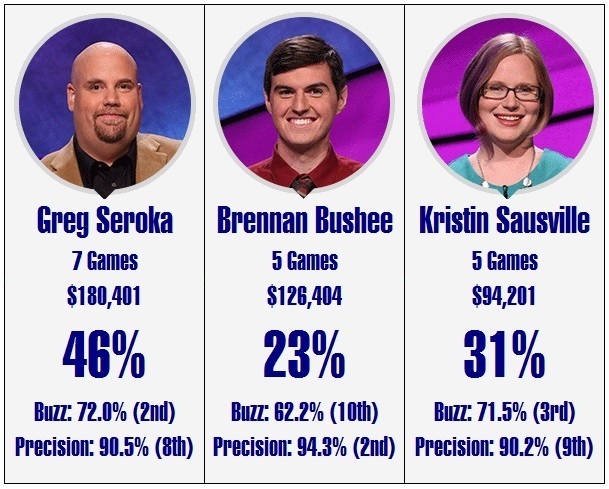 Rebecca Rider had a tough match, and her poor precision is probably related to the fact that she only attempted 12 responses. 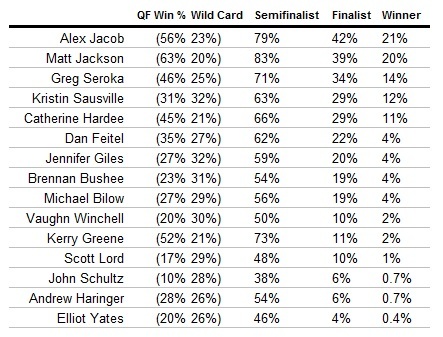 Strategically, the players went searching for Daily Doubles early, and attempted to use them to their best advantage. 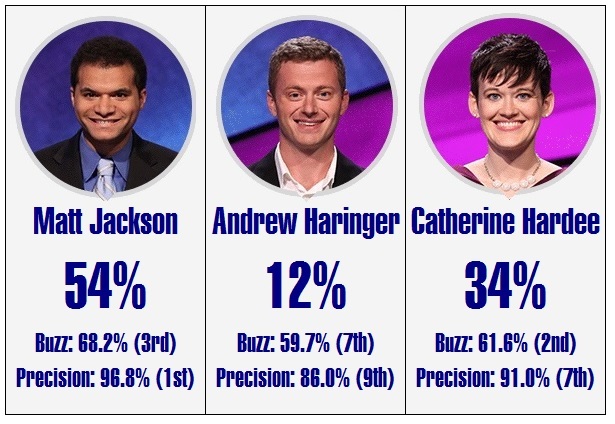 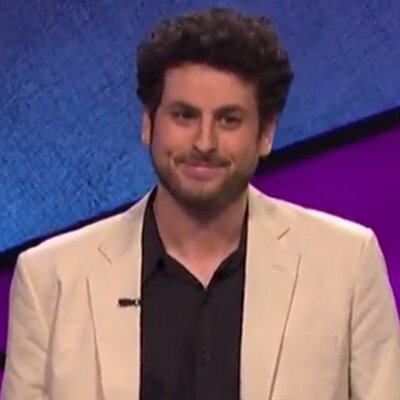 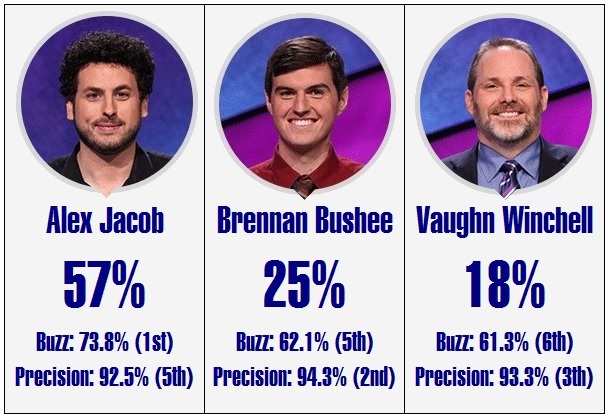 Both Ingram’s early Jeopardy round DD and Pearson’s early Double Jeopardy DD came in situations where all-in wagers seemed logical; it was unlucky that both missed their responses. 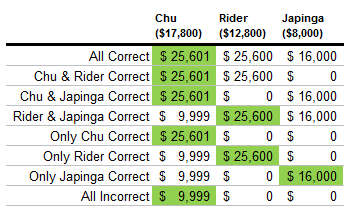 Ingram’s second DD of the game came midway through the round with him in a commanding position, leading $11,600 to Rider’s $3,800 and Pearson’s $1,200. 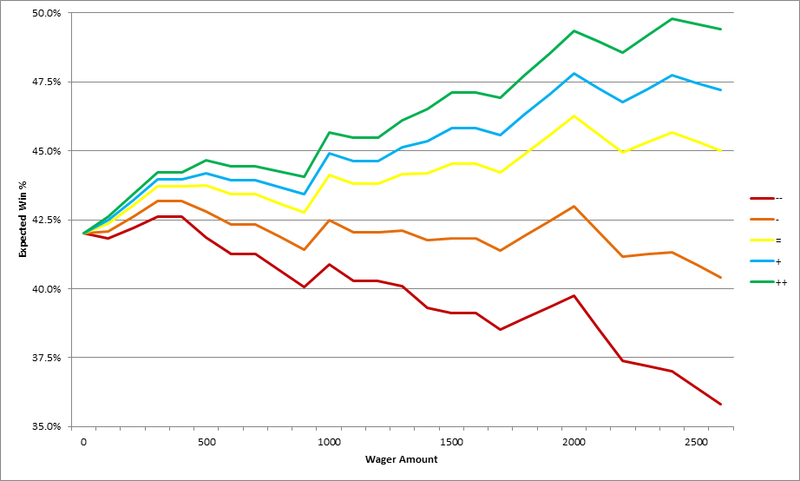 I’m doing some preliminary work on theories behind Daily Double wagering, and even in the best of cases I think the maximum one should bet in this situation is around $2,500. 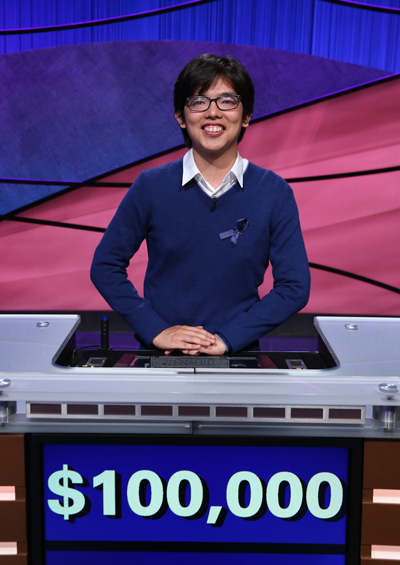 His bet of $100 was born out of smart quarterfinal strategy, looking to secure a high score rather than trying to lock the game down. 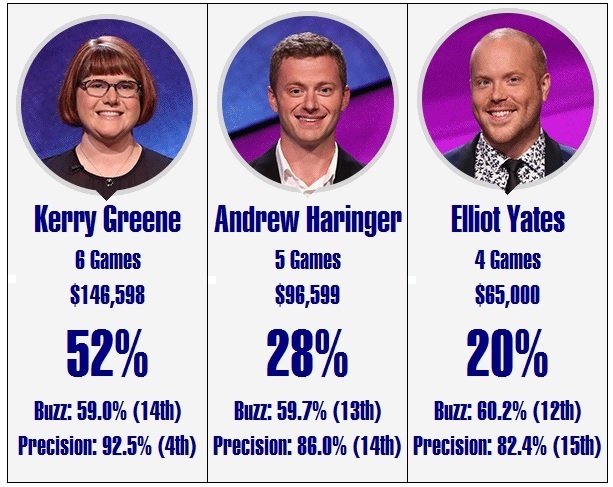 It’s possible that his failure to bet big prevented him from securing the lock game, as Pearson went on a late run to stay in the running for the automatic berth. 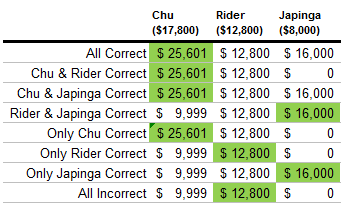 The scores finished $16,100 to Ingram, $8,400 to Pearson, and $6,600 to Rider. 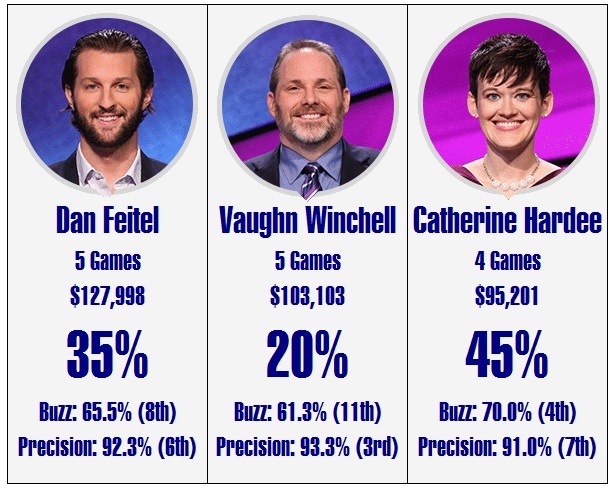 The way I saw it, Ingram had two choices for wagers: the traditional lock-out wager of $701, or the conservative $0, maximizing his chances of earning a wild card while still possibly winning the match. He chose to wager $701, which I think is the correct choice. 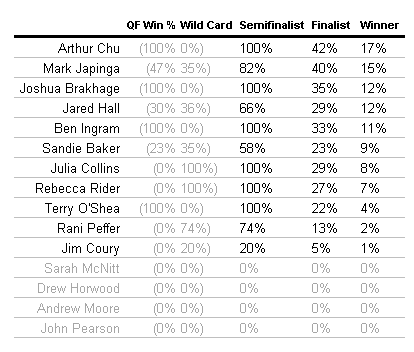 If he’s wrong and John doubles up, he’s only cost himself 4% on his chance of winning a wild card by losing $701. 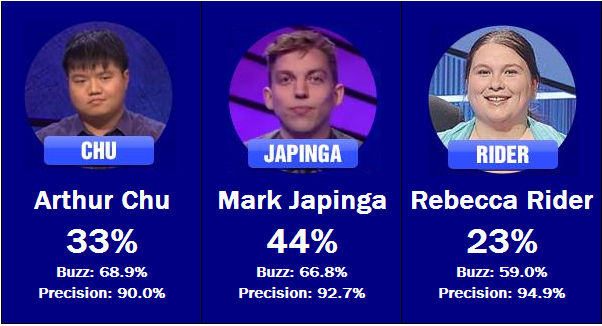 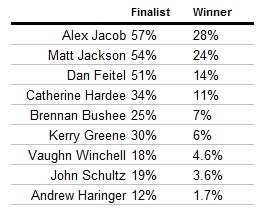 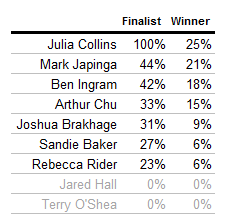 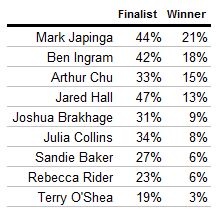 On the other hand, his chances of winning the match outright go up by almost 20% with the wager of $701, since he now wins whenever he answers correctly and Pearson misses, whereas before he was at the mercy of Pearson’s response only. 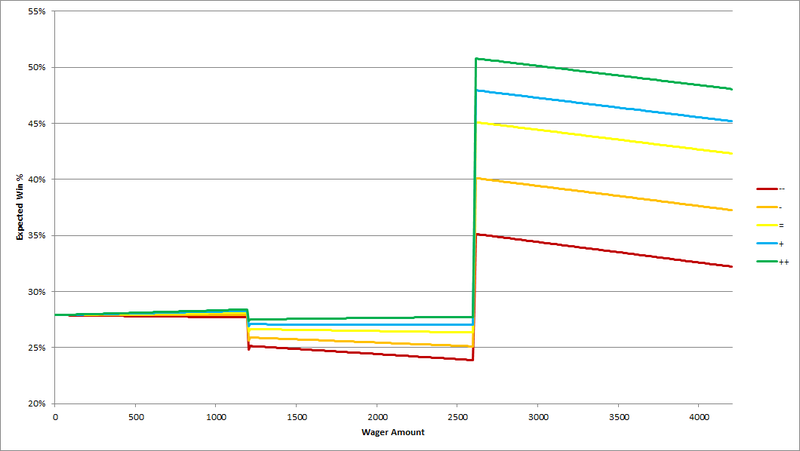 Rider opted to wager only $5,000 of her $6,600, a wager that I cannot support. 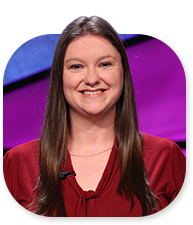 She’s playing solely for a wild card spot at this point – there should be no permutation that allows her to win on a Triple Stumper. 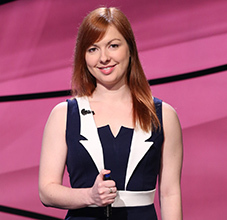 In that case, since $6,600 is below the expected wild card cutoff line, she really should be looking to double up to maximize her chances. 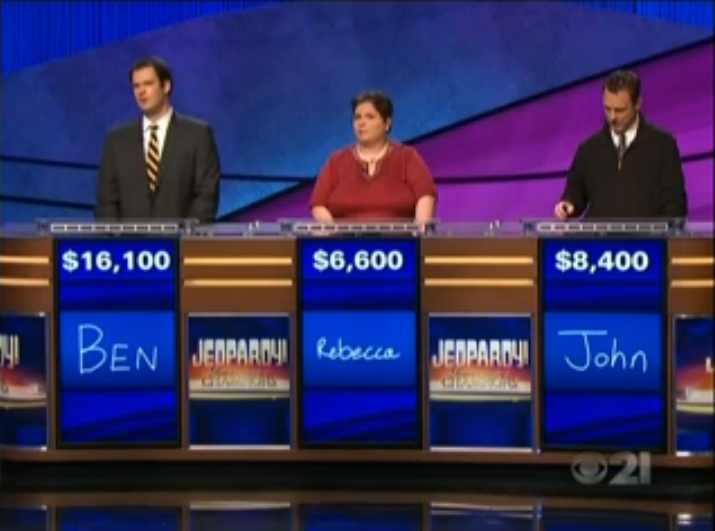 If she doubled up, I expect her score to earn a wild card 48% of the time. 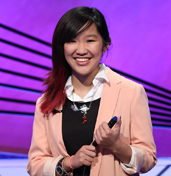 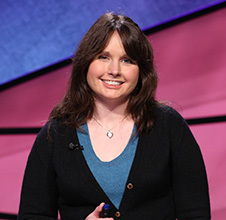 As it stands, she answered correctly, and her final total of $11,600 leaves her with a 39% chance of advancing. 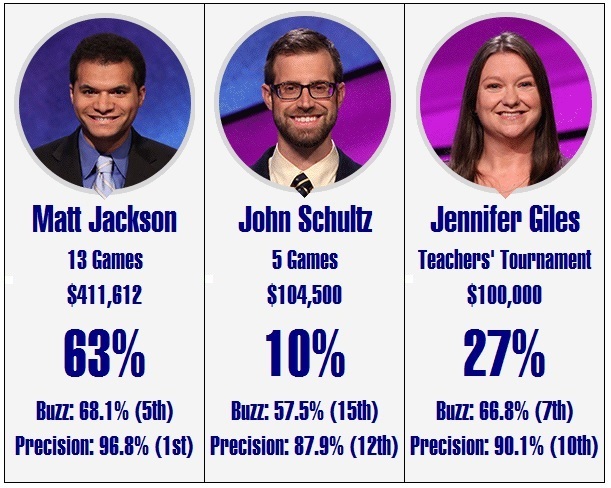 Had she missed, a score of $1,600 would have advanced only 2% of the time, so it’s likely not going to be worthwhile to leave something in reserve. 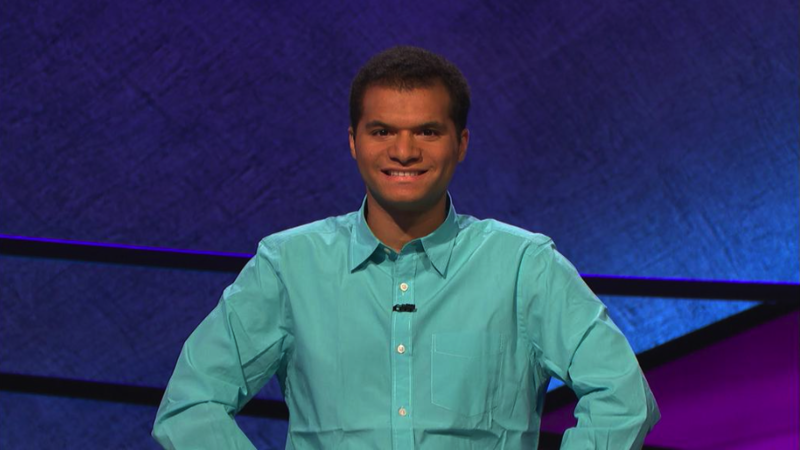 Pearson was in a similar situation as Rider, and chose to bet everything. 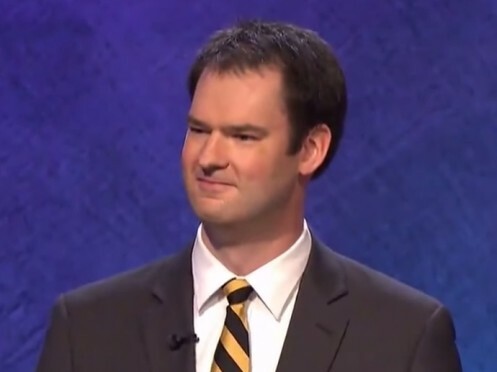 If he stood pat, he would only advance 12% of the time. 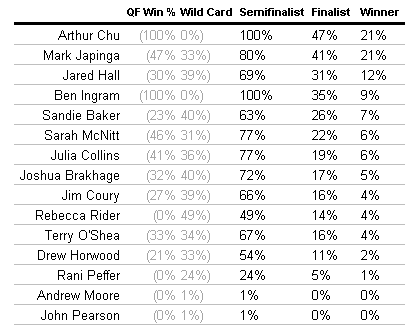 If he doubled up, in addition to the chances that he would win outright, his score of $16,800 would see him get a wild card about two-thirds of the time. 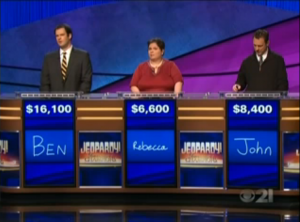 Unfortunately, he couldn’t come up with the right response, and barring a major miracle his tournament is over. 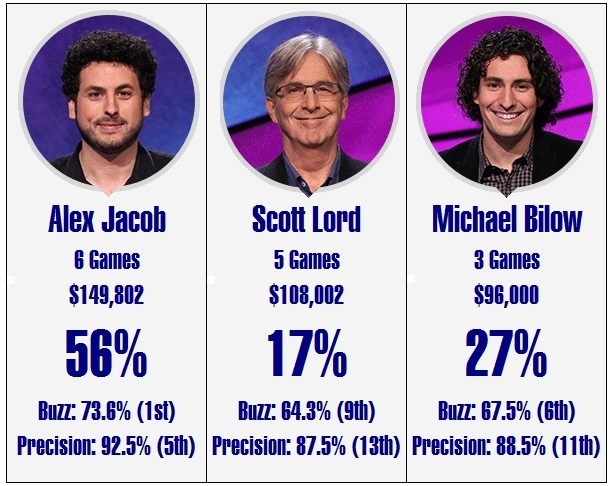 The biggest winners tonight might actually have been the other 12 contestants. 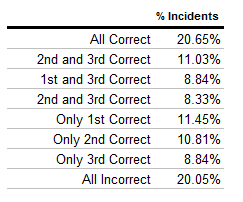 With Pearson out of the running and Rider putting up a solid, yet beatable score, everybody’s chances of earning a wild card go up a few percentage points. 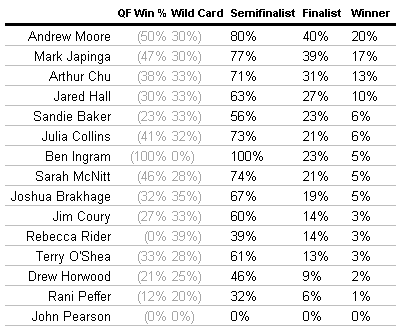 Despite winning, the shifting wild card situation sees Ingram’s chances of winning the whole event go down thanks to the potential matchups in the semifinal becoming worse. 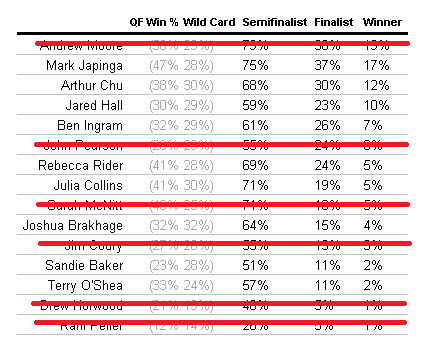 Sandie Baker’s chances have actually tripled, due to the increased chances of getting a wild card and her own potential road to the final improving. 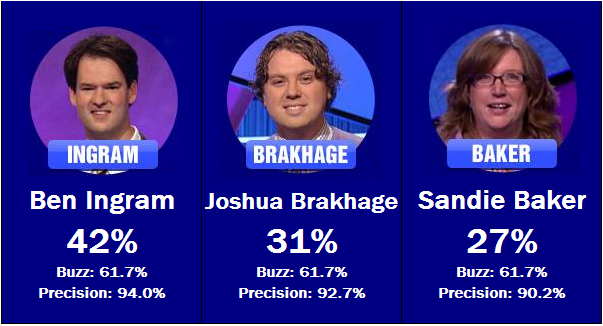 See you back here tomorrow, where two of the top three play against each other. 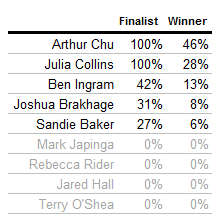 And Rani Peffer probably beats Arthur Chu and Andrew Moore to throw all my predictions into the garbage.